NNN. No. 2 - "The Belated"
After much delay and intrusion, the second issue of Nothing. No One. Nowhere. ; that which shall forever be related to as “the belated,” whether in loving tones or otherwise, is available for the viewing public! Yes–you can now lay your eyes and hands on this much though of, sought after sequential to the first Nothing. No One. Nowhere. This issue is jam-packed with poetry, prose and art and reviews. All that is there for you, the loving reader. Work by David S. Pointer, Peter Magliocco, Michael Mc Aloran and Howie Good are included, just to give a clue. An art spread by Michael Mc Aloran is featured alongside this enigmatic writer’s prose. Three selections brought to you in a manner only this Irish artisan of word can. Also Mc Aloran’s abstract paintings grace this collection and the issue’s cover. …the second issue of Nothing. No One. Nowhere. To forever be cheerfully referred to as, “The Belated” I extend my greatest apologies to readers, and especially the writers of this publication. I know the anxieties of patience are nothing when awaiting the promises of accepted publication, which is why, at the behest of our dear and good publisher, I am writing to you now. To be sure, there will be changes here at Nothing. No One. Nowhere., but a good revolution always served the better purpose. To that end, I ask, should your interest still be perked regarding our wayward publication, to stay abreast on guidelines and expectations and we will most assuredly do the same for you. Thank you, again, to each contributor and to you who have taken the time to gaze into our magazine. 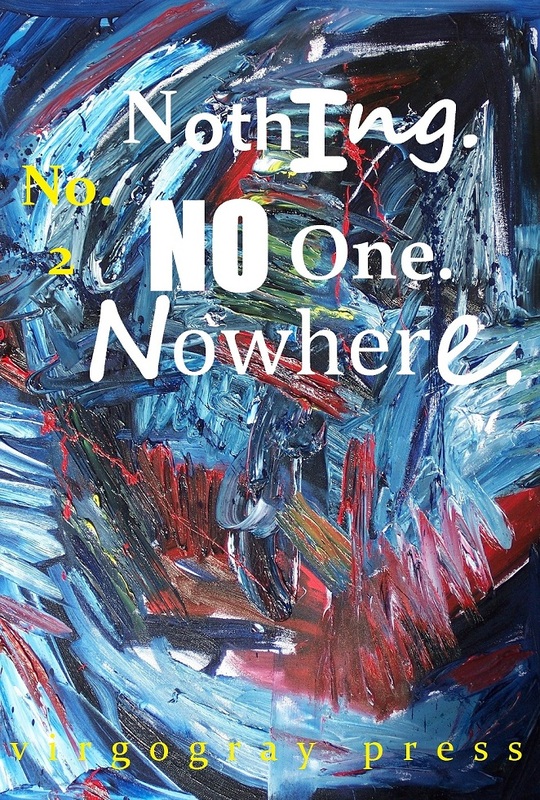 Check out some previews of the issue at http://nothingnoonenowhere.blogspot.com/ or purchase at http://www.lulu.com/product/paperback/nothing-no-one-nowhere-no-2/16793658. There are two editions of this publication available. One edition is the full color magazine, the second a black and white edition with all images printed in grayscale. We recommend the color editions to enjoy the full quality of the issue and are publishing at cost, but are happy to provide an alternative as the costs of our economy are the chief consideration of the alternative creation. Both full color and b/w editions of Nothing. No One. Nowhere. No. 2 are available at Lulu.com now.